Every sin IS death, because every sin is a way of rejecting Life. (In fact, it's because it rejects Life/God that it's a sin.) But this is, so to speak, a “natural” phenomenon, not a point of law. So far as I can tell, there is no legal thing in all of Scripture that requires death for every single sin. In fact, in the Old Testament, relatively few sins were capital offenses, such that the Law of Moses required the offender(s) to be put to death. Most sins could be atoned for by the prescribed tabernacle or temple ritual, provided that rite was accompanied by contrition and repentance. The sin offering also did not necessarily require death. If a person could not afford a bullock or a goat, then he was to bring two turtledoves or two young pigeons; but if he could not even afford that, fine flour would suffice for his sin offering. (Leviticus 5:11-13) From the fact that flour is unable to suffer, we can easily see that a “substitute victim” was not the idea behind sacrifices. Vicarious punishment is not what was being offered to the Lord. There are numerous other passages in the New Testament that speak of salvation as “the gift of God,” including, for example, John 4:10, Acts 8:20, Ephesians 2:9, nearly every verse of Romans 5, from verse 15 on down to the end, and others. The thing to notice here is that the gift of God not only is no gift at all if we earn it, but also and equally is no gift at all even if Jesus Christ earns it. Earlier this week somebody tried to tell me the gift was free to us, but not for Christ, Who had to earn it on our behalf. Of course this is not biblical. The biblical doctrine is: “The Father loves the Son, and has given all things into his hand.” (John 3:35) and “For as the Father has life in himself; so has he given to the Son to have life in himself;” (John 5:236). There are two or three reasons I was intrigued by the use of this passage. One is that there are other passages available from which the heterodox could make a somewhat stronger case (which I’ll come to). And the third thing that intrigued me about the use of this passage is its ending: “the precious blood of Christ, like that of a lamb without blemish or spot.” That phrasing calls to mind the Passover Lamb. The Passover Lamb was not a sin offering. The Passover Lamb was offered so that (1) its blood, smeared over the doors of the Israelites, would tell the Angel of Death to skip this house, and (2) its flesh would nourish the Israelites on their journey out of slavery. Indeed, of all the kinds of offerings to God prescribed by the Law, the Passover Lamb is the type par excellence of Christ. That’s why Christ died at Passover, and why His last supper was a Passover meal. “Christ our Passover is sacrificed for us,” says St. Paul (! Corinthians 5:7). The other sacrificial animals are comparatively lesser types of Christ. The scapegoat, for example, was not slaughtered, its blood was not shed; hence, it makes a less apt type. The goats and calves were slaughtered, but nobody ever says, “Behold the Calf of God!” or “Behold the Goat of God!” It’s the lamb. There was a lamb used as a sin offering, but for ordinary people (excluding the VIPS of the day) that lamb had to be female, so again, it isn’t all that good a type. Christ is specifically our Passover Lamb. In short, I Peter 1:18 is not talking about Christ buying anything for us. But again, when you start to try to pin down the meaning of these verses, you find out they are not to be taken absolutely literally. That is because if you ask from whom we were bought, there is no good answer, just as there is not in I Peter 1:18-19. Did Christ buy us from God? But God is not the one who was holding us captive. Moreover, as we have seen, God has already, from all eternity, been giving the Son all things. (John 3:35) Were we purchased from satan? But that is outrageous, to pay that outlaw anything, much less give him Christ! It would mean God the Son had sold himself to the enemy. So where we see language about ransom or purchase, we recognize a figure of speech referring to the severe ordeal Jesus had to undergo in the course of rescuing us from sin and death and the devil. And from a thousand other things, such as "the useless traditions of our forefathers". Jesus pays the ultimate price in the same way some of our soldiers do in Iraq and Afghanistan. We don’t mean they are literally paying anybody off; we mean they died. My son-in-law ran the Marine Marathon earlier this week and finished in 3 hours, 40 minutes, and the price he had to pay, besides months of rigorous training, was a lot of pain for two days afterward. But when we speak of the price he paid, we do not mean he bribed the judges or paid off other runners or that anything literally changed hands. We mean he had to undergo a lot. And that’s how we mean it when we speak of the precious price Jesus paid; we mean He set us free, but had to endure a horrible ordeal in the process and shed His precious and life-giving Blood. We do not mean He paid off the Father or the devil. A gift is a gift. A gift is free. A gift is UNEARNED! Even Christ can’t earn it for us, because the Father is already giving it for nothing. That’s what Grace means. To believe Christ had to bribe God on our behalf is to underestimate, very considerably, God’s love. It also underestimates His sovereign power and, as I think I could demonstrate, it is a bad parody of His Justice as well. It’s just very, very hard for us, isn’t it, to accept that God loves us that much? Especially when we’re keenly aware of how we SO do not deserve it! The sheers in our sunroom have never been pressed. The turmoil, the frustration, the sheer agony of getting them in the first place left us unwilling to do anything but take them out of their packages and hang them. I was hoping the wrinkles would "fall out" of them over time, with the help of gravity and humidity, but no such luck. A steamer didn't do anything, either. So today I took down 8 of them (out of 36, I think) and pressed them, for a start. I had to stand up on a chair and unscrew the ends of the curtain rods and slip the curtains off and back on again. "It's not worth the trouble it takes to do this!" I muttered, grumpily, as the tightening screw slipped from my fingers and rolled across the floor to its undisclosed location. "Oh, but it is!" said Demetrios. "My love, look. This one looks so much better! Much, much better, just look! The sides are a little rough; I don't know why, but overall, it's a big improvement." I just smiled at him. "The sides are rough because that's one of the curtains I haven't pressed yet." I may not, either, because just as I said that, the whole bracket came loose from the wall. A dear reader commented this morning, privately, that I had posted a "cliff-hanger" the day before yesterday and hadn't updated it yet. Thanks for caring! The dinner party Monday night went very well; everyone had a good time. Erin, my daughter, who was still here Monday morning, commented that it wouldn't in the least faze her mother-in-law to find out 12 people were coming to dinner the next night. "She'd just say something like, 'Okay, I'll put in a chicken breast and make some salad...'"
"Dial her number for me!" I demanded. Nancy suggested a ham with scalloped potatoes, or perhaps a lasagna with salad and garlic bread, which is what I chose. Go to allrecipes.com, said Jeff (son-in-law) to find a good recipe. Just type in "lasagne" and sort the search results by ratings. So I made the first one that came up, rated 5 stars, called, "World's Best Lasagne," with about 5,000 reviewers who agreed that it was. It was a success. So was the chicken pot pie Anita so graciously brought us. Thank you, Nancy! Thank you, Anita! I dumped some canned apple pie filling into a frozen crust and made my own crumble to go on top of it, easy. Also made a double recipe of "Mike's Salad" aka "Five-Cup Salad," aka "Ambrosia", also easy. (Combine one cup each of: pineapple tidbits, mandarin orange slices, coconut, sour cream, marshmallows.) We still call it "Mike's Salad" in our family, even though Mike finally let on, some years ago, that he doesn't particularly care for it. And I made some Greek meat balls as well. It wasn't until yesterday we realized we had forgotten to offer anybody coffee after the meal. That's because I don't drink it, so don't think about it. Don't even know how to make a good pot of coffee, or even know good coffee from bad; to me, it's all bad. Oh, well. Nobody asked, either. Perhaps the wine and beer and cider were enough for them. The topic of the evening was what to do about public sinners in the church. Specifically, a man who was convicted of theft and jailed. He came back to the church, whatever that means, once he was out, but in a short while, it happened all over again! And he was back in jail. Now he goes to some Protestant congregation. They've prayed over him and everything is alright, as far as they're concerned. Another woman was caught using church funds for personal use and has almost never been seen in church again, except for her father-in-law's funeral. Nick said he had invited her and her husband several times to join our weekly supper club, and they always say they'd love to come but never have. I thought, at first, it was pretty audacious of Nick to do that without consulting the rest of us, but after a moment I decided I admire that kind of audacity. And I'm pleased he felt free to do it, knowing we'd all concur. Demetrios commented that the reason we forgive but can't forget is, we are afraid such people will do it to us again, or else the memory of their misdeeds just provokes hostility. Christ, he pointed out, was in such communion with His Father, and had such perfect trust in His Father's care, that He had so such fear and no such hostility. Neither will we, when we become sufficiently mature in the faith. It's relatively easy to know what to do about such people at the personal level, but what about corporately? Do we welcome them back into various church organizations? Do we let them hold office? My own supposition is, we ought to follow the lead of the priest. If we see him giving the person Holy Communion, we can safely assume the person has been to confession and been absolved and should be dealt with accordingly. Ah, the ancient practice of public confession had its wisdom! Our word witch stems from the Anglo-Saxon wicce, which in turn comes from the Indo-European weige, meaning violent strength. It has the same root as the Latin vincere, to conquer. Some of our English words stemming from the same word are: victor, victim, wicked. All Witches are properly called, “Witches”; it is not proper to refer to male witches as warlocks, wizards, or sorcerers. Witchcraft is a religion. Another term for the Witch cult is The Old Religion, and it may well be the oldest extant religion. A precise uncovering of its origins is probably impossible, since it arose in many forms and many times and places, and Witch deities have been called by many names. Adding to the obscurity is the fact that the religion is a secret one. Its beliefs, practices, and traditions have all been transmitted orally. Basically, the Witch cult developed from the worship of the Moon Goddess. The Moon was early thought of as feminine, since a correspondence was noted between its 28-day cycle of wax and wane and the 28-day human menstrual cycle. Hence, from very early times, the Moon was associated with fertility and worshipped as Great Mother, life-giver. The Greeks called her Artemis, the Romans, Diana; other peoples called her by scores of other names. The Moon Goddess came to be depicted as more or less human, often shown with multiple breasts or with her symbol, the crescent moon. In time, anything crescent shaped came to symbolize the Moon Goddess. The crescent horns of animals, for example, became sacred symbols; and when a male deity developed in the religion, he had cloven hooves, goat’s legs, a tail, and horns on his head. It was this deity who formed the popular Christian image of Satan. Witches are not Satanists. Witches primarily worship a female deity who is considered to be the Life Principle; Satanists worship a male diety thought of as the principle of evil. The Witches did and do not think their deities as evil. You may disagree when you hear of some of their practices. Yes, Witches did engage in orgies. Yes, they did boil babies. Baby fat was an essential ingredient in some of their magical recipes. They preferred to steal unbaptized babies, another reason Europeans were eager to have their bundles from heaven baptized as soon as possible. Meanwhile, until the baby could be baptized, you would put salt around the cradle, because Witches would avoid salt - or at least, so it was thought. I do knot know whether they really did avoid it or not. Salt is used to this day in the Roman Catholic baptismal rite. Witches were and still are organized into groups, called covens, of no more than thirteen. (This is where we get the notion of unlucky thirteen.) But on certain special days, Witches gathered into larger groups at festivals called Sabats. Two of the most important days were the Spring Equinox, when the days began to be longer than the nights and Witches gathered to usher in the Spring; and the Fall Equinox, when the days began to be shorter than the nights and Witches gathered to ensure that Winter would not last forever. The Summer Solstice (Called Lady Day or Midsummer’s Eve), the longest day of the year, and the Winter Solstice, the shortest day of the year, were also important holy days. In the Druidic form of Wicca, among the Celts in the British Isles and in Normandy, October 31 was called Samhain (pronounced “sow-in”, as in a female pig). People believed that on this "Day of the Dead", the deceased returned to haunt the world, to visit their families, and to take revenge upon their enemies. At night, great bonfires were lit atop every hill to frighten the spirits away. People huddled in their houses all night, keeping watch, having cleaned their houses thoroughly and made elaborate preparations to be sure the wandering spirits would find nothing offensive there. This is the origin of the tradition of spooks being out and about on Halloween. Witch ceremonies were designed to ensure the continuing fertility of the crops, the animals, and the people. Fertility depended upon the regular rising and setting of the sun and moon, the cycles of rain and sunshine, the comings and goings of the seasons – and all of these, in turn, were controlled by Great Mother. Witch rituals, then, were designed to help the Great Mother along, to give her encouragement. This was done by means of imitative magic. Imitative magic involves acting out some hoped-for outcome, imitating it, so the deities will see what you want done and be encouraged to do it. If you stick a pin into a doll’s chest in hopes that someone the doll represents will have a heart attack, you are using imitative magic. What the Witches did to ensure fertility was to put on animal skins and horns and dance around in a circle in a sort of gallop, astride a broomstick or pole wich served as a phallic symbol. Then, when the dancing and the drugs in their brews had worked them into a frenzy, they copulated with as many people as possible. Broomsticks, besides serving as phallic symbols in fertility rites, had at least two other functions. In the days before superhighways, Witches traveling cross-country often used them as walking sticks. Encountering small streams, hedges, fences or puddles, they also used their broomsticks as pole vaults. Thus Witches really did use broomsticks as means of transportation, in a way. Furthermore, Witches really did believe they could fly on those broomsticks. Before you could go flying, you had to anoint both yourself and your broomstick with magic flying ointment. Witches were expert pharmacologists. They had learned, and had kept as dark secrets, which plants could kill and which could cure, which yielded stimulants and which, depressants, and which plants yielded hallucinogens. What they were really boiling up in those infamous brews was drugs. In other words, those poor dears who thought they were trafficking with the devil were only trafficking with nasty old broomsticks. In short, the Witches, besides being pharmacologists, were atropine-trippers. So there is some debate among historians as to how many of these Sabats ever really took place, and how many were only hallucinations. 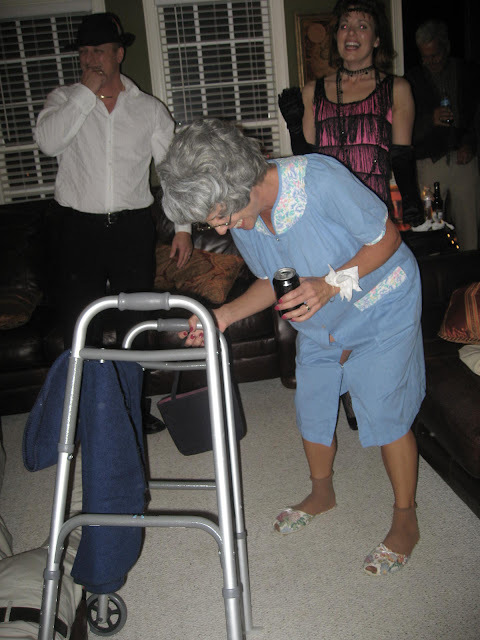 Some of them, at least, really did happen and the custom of wearing costumes on Halloween stems directly from them. There were at least two reasons for wearing costumes at Sabats. The first, already mentioned, was for imitative magic: you looked and acted as much like an animal as possible. With the rising power of the Vatican, however, costumes assumed a second purpose: protection. It is estimated that somewhere between half a million and nine million people were burned to death for Witchcraft in Europe between the 15th and 17th Centuries. So if you were a Witch, and particularly if you were royalty or nobility or otherwise well-known, it was to your advantage to come to Sabat in masquerade. When Europe was first Christianized, it was very common for people to belong both to the Church and to the Witch cult. To believe that God had a Son Who had appeared on Earth and Who was Savior was all fine and good, but you still had to make the Sun and the Moon go around the Earth and the seasons come and go. Christianity had no provision for this necessity. Thus not only common folk, but also nobility, princes nominally Christian, and even clergy and bishops were sometimes also Witches. Why were Witches so persecuted? They posed certain threats, some imaginary, but some very real, to “Church” and society. For one thing, Wicca was a rival religion. Moreover, the magic of the Witches was greatly feared and in fact, sometimes did really work. All those potions, lotions and brews, for example, really could relieve the pains of childbirth or cure or kill or send you flying over the rainbow or drowning in the depths of drug-induced hell. Witches really did know how to hypnotize you. Imagine how frightening that would appear in the Middle Ages. Sympathetic magic, closely related to hypnotism, also undoubtedly did work. Sympathetic magic operates on a well-known principle, the power of suggestion, and sympathetic magic is still to be found in some cultures. Missionaries in Africa, anthropologists in Mexico, from time to time report the following phenomenon. A person commits some offense so heinous that his family, clan or tribe calls a special meeting, sometimes amid much ceremony, in which the offender is officially ostracized and cursed. The accursed is told he will die within X number of days. And much to the amazement of the missionaries and anthropologists, exactly that happens. So strong is the victim’s belief in the power of the curse, and so terrified does he become, that he weakens and sickens and dies, despite all efforts of modern medicine to save him. (He could hardly do anything else, for to avoid death would require a complete destruction of his worldview. Dying is usually easier, especially if a person is unaware of having any particular worldview, or of the concept that there might be alternative worldviews.) Back in the Middle Ages, then, sympathetic magic worked among believers in it, just as it does today. Still other behaviors, not even intended as magic, were taken for magic, and feared. If you walked by your neighbor’s field with a frown on your face and a few days later a hailstorm ruined his crop, you might be in serious trouble. If the children in your neighborhood were being nuisances and you glared at them and shortly afterwards one of them took sick, your life might be in danger. If you were a lonely little old lady and took a cat into your house, beware! Pets, as such, were unknown in Medieval Europe. People had dogs, but they were strictly work animals; they were for hunting and herding; they were emphatically not pets. There were cats, too, but they were wild, as in much of Europe today, they still are. Cats were not domesticated in Europe until the mid-Seventeenth Century. So to have an animal in your house at all was weird and suspicious. If, on top of that, yor cat was tamed, and would actually consent to have anything to do with you, to be familiar with you, well, that was supernatural! Thus, we associate Witches with cats. Ironically, it was neither Rome nor the State that brought about the demise of Witchcraft. It was people such as Copernicus and Galileo, whose theories showed that all the dancing in the world won’t get the Sun to go around the Earth; in fact, it never had gone around the Earth. More recently, the Witchcraft revival has largely been a function of feminism, of women seeking a woman-centered religion. The modern Witch cult attracts mainly the young, the anti-establishment people, folks disillusioned with their denominations, rebels, romantics, and feminists. Modern Witches assemble in homes, apartments or dormitories, in groups of 13 or less, ideally with an equal number of males and females. They don’t dress up; they strip down. The only item they wear within the magic circle is a necklace, preferably of silver, the color of the Goddess. Clothes, they say, prevent their magical powers from flowing freely. They sit in their magic circles and practice their old magic and seek unity with their Goddess. They still chant spells and charms, still practice what we would call parapsychology, still bind one another with strict oaths of secrecy. And Halloween is still their High Holy Day. 1 What Were Those Witches Really Brewing? Is the title of an article by Andrea Dworkin that appeared in Ms. Magazine in 1974. It’s a feminist diatribe, but I have always liked the title and wish to give her the credit for it. 2 Harris, Marvin, Cows, Pigs, Wars and Witches: The Riddles of Culture (New York: Random House, 1974), pp. 219-220. 3 Ibid, p. 236 ff. That's what my daughter and I, and my son-in-law and little Sydney asked Demtrios last night, about 10:30 or so, after we had told him all about our weekend in Washington. Jeff ran the Marine Marathon and finished in three hours, 40 minutes. And we saw Mom and Wendy and Mike and Daniel and Lizzie and Tisho and Stuart, and Carol Snitzer. We all had dinner together, that's our news. So what did you do, Demetri? Not much. He phoned a dozen of his closest friends and invited them here to dinner tonight to help celebrate his name day, that's all. So I'll tell you more tomorrow! Gotta run to the grocery store now. At least it's good for a laugh, huh? Happy Feast of St. Demetrios, the Holy Great Martyr! The Annual Orthodox Blogosphere Halloween Debate is heating up again, and I have no answers for you. Emily’s advice is always the best: ask your spiritual father. I used to be an avid fan of Halloween, and yes, my house was sometimes one of the scary ones; we turned our carport into a dark, twisty passageway kids had to walk through to get to the door, and in the passageway were various live and non-live spooks and scenes. I threw a costume party most years and decorated with those skull-shaped candles and spiders and such. Oh, yes, we held séances, too, and by a bit of family choreography, made sure the spirits from the other side would manifest themselves. 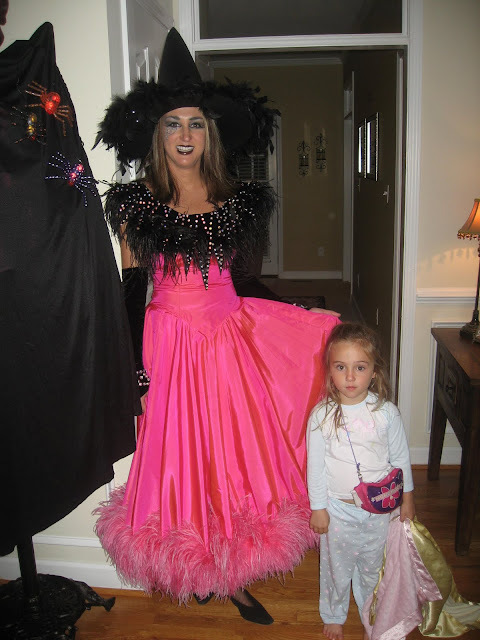 I always wore glow-in-the-dark makeup and performed a couple of magic tricks. Flashback: I was trying out my makeup a week ahead of the party one year when I heard a terrible crashing sound outside. A 16-year-old boy, driving while intoxicated, had missed a sharp curve, hit the embankment on the right, been sent sailing in the air all the way across to the left, where his car first hit a telephone pole, then landed back on the ground. Then the telephone pole fell on top of his car. I grabbed my first aid kit and ran to the scene. The boy was sitting there, dazed. His window was open. “Are you alright?” I shouted. He didn’t answer. He opened the door and ran. I had forgotten I was wearing glow-in-the-dark makeup. “Who is she?” an officer asked. Ethel happened, just happened, to be a friend of mine. I knew her number by heart. But I didn’t say any of that. Conscious by now of my glowing face, I just slowly recited the telephone number, and then I went home. When I became Orthodox, my interest in Halloween dissolved all by itself. I knew it was a pagan feast (see an upcoming post for more details) but that wasn’t the reason. I just didn’t care for it anymore. Especially for the ugliness. Scary faces and blood and gore and spiders… why? What did I want with those? 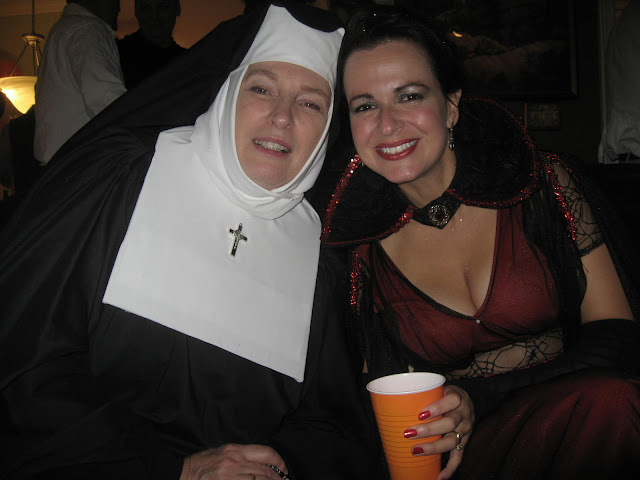 But I have to confess there are two aspects of Halloween I love. One is costumes. I’ve a passion for them. I once spoiled my chances with a guy I adored when he finally asked me on a date. 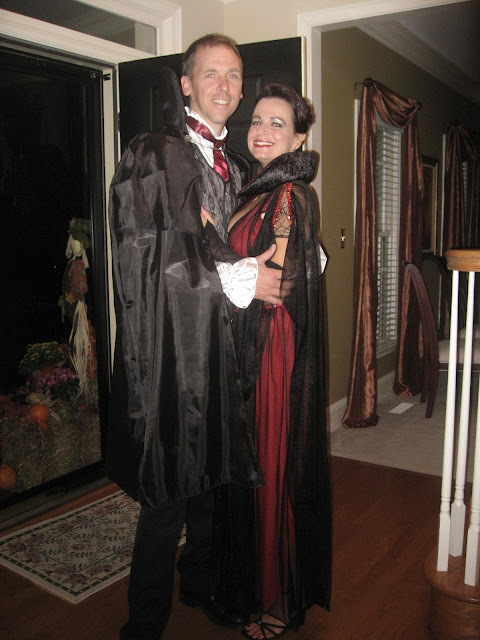 It was to a Halloween dance. 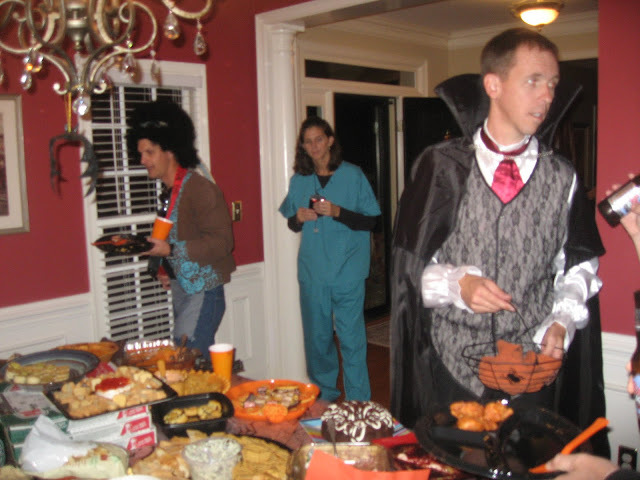 Common sense would’ve told me to go as a princess, but I was determined to win the prize for Best Costume, so I dressed up as an African Witch Doctor, complete with an Afro, blackface and ring in my nose. I won the prize and lost the guy. 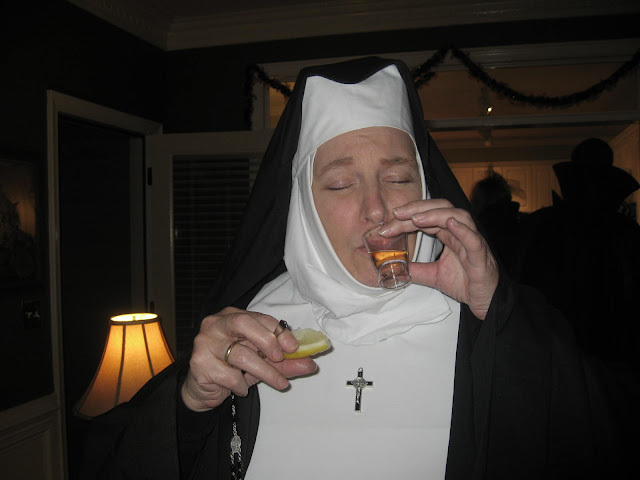 Okay, so whether a costume is appropriate for a Christian maybe depends upon what it is. Some photos I've seen of Mardi Gras in New Orleans show absolutely lewd costumes. But decent, modest, non-frightening costumes? Until last year, it had been many years since I carved a pumpkin, but last year I became aware of a new (to me) pumpkin-carving technique: shading. You can achieve shading by removing the outer skin of the pumpkin and then not necessarily cutting all the way through, but only deep enough to let in whatever amount of light you wish. This technique also eliminates the need for your pattern to be in the form of a stencil. See examples above. 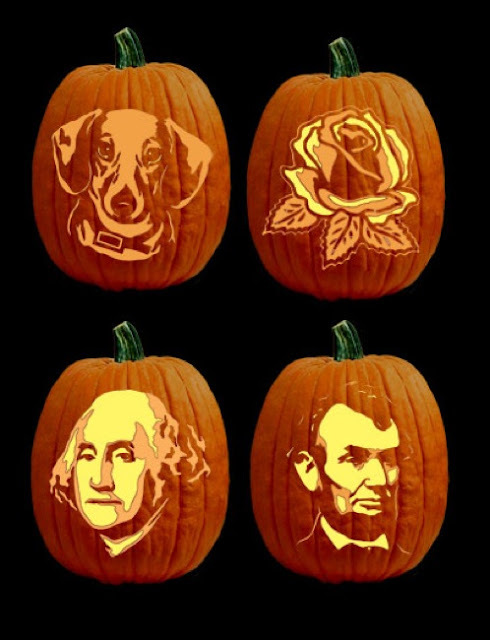 So last year I carved a portrait of a certain presidential candidate, and many folks thought a pumpkin was where that face belonged, too! I just think you can carve a pumpkin without endorsing human sacrifice, and you can wear a costume without giving aid and comfort to Wiccans. But maybe not. Don’t go by my feelings. Take Emily’s advice and ask your spiritual father. Doing what he advises will always be best for you and for your soul. You are happily surfing the Internet when a large box appears with lots of red in it. It says something like "WARNING! YOUR COMPUTER IS INFECTED!" and it lists 20-odd infections, each with a scary-sounding name. "Clean Now," urges the box, and the next screen will say, "Click REMOVE" to remove threats!" And this frightening box has logos that may look like the ones your own security system uses. Don't do it. Clicking on that "Remove" button will actually download the virus, and it's a nasty one. I know because I've spent the past nearly 48 hours trying to cure it. The first thing it does is knock out your security programs: Norton or McAfee or Windows Defender or whatever you have. These will be disabled; their icons may not even appear any more. 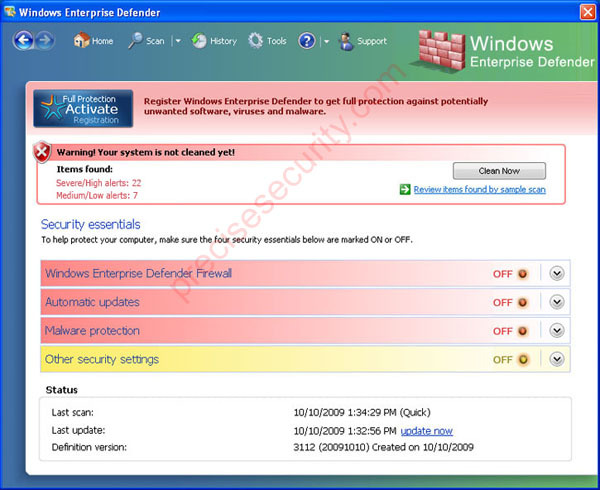 They will be replaced with this fake called "Windows Enterprise Defender." It will also whack your Google account, so you will no longer have access to Google. For me, that meant I couldn't sign in to my blog or leave any comments on yours or see the maps I've created in Google Maps. And every few seconds, the bug will interrupt whatever you are trying to do, urging you again to "Remove" the fake threats. So next time (and every time) an alarming "WARNING" box pops up from nowhere and says a scan of your computer has revealed several critical threats, stop and take a deep breath. Ask yourself, "Have I been scanning my computer? Did I schedule a scan for this inconvenient time?" And then do nothing at all with the box. Even if it looks like it IS your security system, go and open, in the usual way, the one you know is your real one, and use it to scan and remove any viruses you may have (but probably don't). Warning: What follows is preachy, even though I'm mostly preaching to myself. Skip it if you're not in the mood. We are used to realizing, with respect to diet, that what we eat and drink matters. It matters whether we drink whole milk or low-fat. It matters whether we add the jam to my toast or leave it off. To many of us, it matters a great deal whether our morning coffee is decaffeinated or not. It matters how many calories we consume; if you could lose just one pound a week, you’d be 52 pounds slimmer by this time next year or 25 pounds lighter by April! Most of us are also aware that it matters whether and how much we exercise. Just 10 minutes of brisk walking every day would do each of us worlds of good. Lifting 2 pounds may not seem like much, but do it for a while and very soon, you’ll be up to 10 and more and your body will be acquiring a nice definition. We all know it matters how much alcohol we consume and whether we smoke that cigarette or not. What must of us remain willfully unaware of is that every single choice we make throughout our whole lives matters – in a similar way, too. Usually we tell ourselves that whatever we decide to do with this moment makes no difference, but it does. Everything we do or do not do builds or reinforces or weakens neuron patterns in our brains. Every decision we make either promotes healthy growth or places a tiny block to normal growth. (And we’re all still growing, our whole lives long, not just when we are children. Or to put it another way, we are all still spiritual children.) Everything we do leaves its imprint upon us (and quite literally upon our brains). Everything we do reforms or deforms us; in religious terminology, leads us toward heaven or drags us toward hell. The immediate effect of our decisions and actions is miniscule, but the cumulative effect is unimaginably enormous. Friday I drove down to North Carolina to see my children and grandchildren as well as to attend the masquerade Mark and Katherine (son nd daughter-in-law were throwing. I love costume parties! Mark and Katherine's daughter, Kelly, wasn't feeling very well, so with regret I put off seeing her and her brothers until next trip. Only got a glimpse of the twins. Ryan and Connor have decided they do not want separate beds and they both sleep in Ryan's. When some of us tiptoed in to see them, Connor had his arms around Ryan's waist and his head on Ryan's rump, for a pillow. Adorable! Here are some pictures from the party. We only took 271 of them! Clicking any of them will make them screen-sized. Here we are, ready to leave the house. Erin is a witch, Jeff is a gangster pimp, and I'm a nun. It's worth clicking this one, to be able to read Jeff's "grill". Erin with Sydney, ready for bed, very tired, and not at all sure she likes seeing her mom look this scary. Erin displaying her dress. 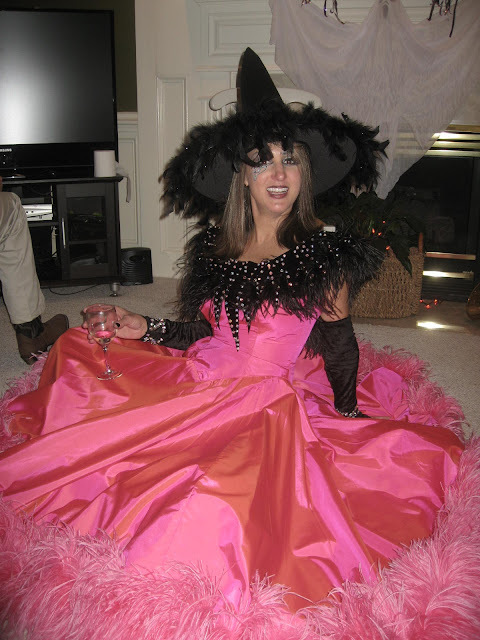 It left a trail of pink and black feathers all over the house. Tasting Tequila, worst stuff I ever drank. No, I didn't take more than 2 sips! 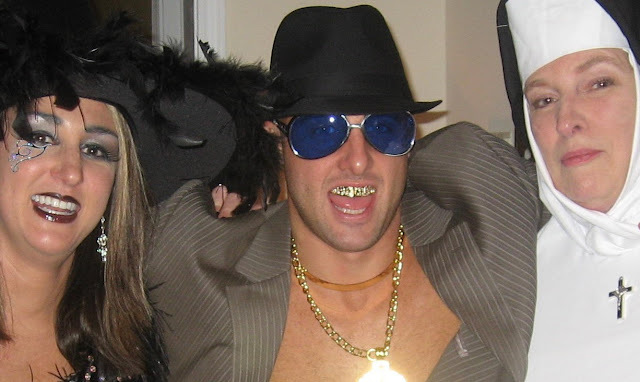 Best Costume. This woman, in reality, is only in her late thirties. Katherine didn't recognize her when she walked in the door. Mummy-wrapping contest. I got to wrap Gilligan, and I thought we should have won, but I was a nun, for heaven's sake, and he was married, and we never thought of adding the cardboard roller to the strategic spot. James administers local government benefits in a district where the textile mills have closed and immigration is high, and unemployment is 78%. So the five of us had tea and biscuits. After a while, went to eat at a nearby farm. The farm family has converted one of its stone outbuildings to a café, and the food was quite good. Among the vegetables that came with our meals was a strange, green thing none of us had ever seen before. It was cooked and it was very good. Afterwards, looking at the fresh produce for sale, we discovered what we had eaten was a green cauliflower, very oddly formed. The farm also raises purple cauliflowers, shaped the same as the usual while ones. I’m sorry; I never know how to describe the joy of being with people one enjoys so much. There never are words for it. We regretted so much having to end our time together to come home and pack and empty out the refrigerator and unplug things and in general, prepare for our trip home tomorrow. One good thing is, our suitcases will be nearly empty. Most of what we brought will stay here in England. We certainly have much to look forward to when we return to Ormskirk. For now, we are anxious about our neighbor in Richmond, Dickie, who in addition to pneumonia, has now been diagnosed with Hepatitis A. That comes from eating contaminated food. We are in a hurry to assure ourselves that he is better. How wonderful to be back where it is still warm most days, and still sunshiny! Our "balcony," as Demetrios calls it, was finished during our absence, too. It's a large, raised back porch, tiled in beige, with white railings around it, just off our sun room, or what the British call a conservatory. There is stonework around the raised area (hiding the cinderblock). It all looks very pretty. Our neighbor, Dickie, is still in bed, but improving gradually, and it isn’t Hepatitis A after all, but B, which is a considerably better diagnosis. Frances has to be checked for it, too, she says. Today, for us, is just for unpacking and resting. Thanks be to God for a safe trip, and a successful and fun one was well, and for allowing Demetrios’ 45-year-old dream to come true. The big, red buttons beside the bed and the front door are part of the burglar alarm system, according to a note we received today from Kath, the estate agent. Okay. Now it’s time to read the instructions about that. Apparently it’s quite an elaborate system, complete with sirens and strobe lights. He found her, too, and enjoyed a long talk with her, catching up. She also provided him addresses of three or four other nurses they both knew, who still live nearby. In the afternoon, we decided to try to find David and Julia Bate. (Our earlier plan, to attend the Tea Dance in the Civic Hall, had slipped our minds entirely.) Demetrios and David have been friends since 1964, during their bachelor days. Demetrios is godfather to their son, James. We tried phoning and e-mailing them, but apparently all that information is out of date. So we took a taxi to their house in Rainford, a nearby town. It was all we could do, or else miss seeing them altogether. “Well, we’ll joost have to keep all our fingers crossed, then,” said the cabbie, “that they’re home. Because I wouldn’t want to pay this kind of fare if they’re not.” Implication: you’re crazy. Again, there was no way to dispute that, in the circs. We, however, prefer to think of ourselves as adventurous. Great good luck: Julia answered the door! “Theo!” she cried, and bade us come in. We sat in their living room, a large, approximately square room with a conservatory attached to the south side of it, surrounded by a green garden and overlooking potato fields. There’s a gas fireplace at the east end of it, and the walls are light, buttery yellow. There are two cream colored, leather sofas making an L. That’s all we saw of their beautiful house except for the kitchen, which is large because David is a gourmet chef. It has black appliances and is very well stocked with wine, the bottles lying atop the cabinetry all around the room, necks toward us. Demetrios says David always had a flair for design. So we sat and had tea and biscuits (cookies), confirming my hunch that tea as I have always known it is little more than scented water by comparison. Then, because they had a dinner engagement, they drove us home, we all having first exchanged up-to-date contact information. They are to pick us up and take us somewhere for Sunday dinner tomorrow. James (“Jamie” to Demetrios) will also be along, so I’ll get to meet him as well. We have a picture in Richmond of Jamie as a toddler. That makes 11 friends we have tracked down here so far (not counting the ones in the churchyard). We haven’t spoken to all of them yet, but we know where to find them. Not bad for a start! It was a long, hard day for us, but loads of fun. First, we walked into the middle of Ormskirk where we accomplished several missions. We left our thank-you note to Mrs. Williams with Kath, the estate agent. We had a copy made of our one and only key to one of the doors. Now we each have a full set of keys. We bought a gift for Demetrios’ boss. Then we caught the bus to Southport, where we paid our solicitor another 15 pounds for which he had sent us a bill. Demetrios said we should buy saucers, too, which we forgot when we bought the rest of the dishes. I said no, because we’re only going to give those things away when we come back. He said they should be given away WITH saucers. He’s right. So we bought the 4 saucers. We then had a good time looking around in that store (Broadbent & Boothroyd’s) and at the home department of Debenham’s, and noting things we ought to acquire on our next trip, notably things for the bathroom. I don’t know what it is with bathrooms around here, but none I’ve looked at personally or seen in pictures ever has a medicine cabinet or a shelf or rack or cupboard. The result is, you have to line up your shampoo and shower gel and deodorant and hairspray and such along the floor, or a window sill or ledge if you have one. After we’d killed a lot of time window-shopping, we crossed the bridge to Ocean Plaza and had supper at the Premier Inn’s restaurant, because right outside of it is where the British Musical Fireworks Championship was to be held, beginning tonight, and lasting 3 nights, with 7 competitors. I had Sticky Toffee Pudding again, this time served with custard. “Custard,” here, has the color and approximate taste an American would expect it to, but it’s served warm and in a small pitcher. You pour it over your dessert. Afterward, we joined numerous others out on the patio to await the start of the British Musical Fireworks Competition. It was TOO DARNED COLD! Southport, because it’s right on the ocean, is always colder than Ormskirk, 7 miles away. The wind was up, too. So we departed. The place was full of vendors selling flashing toys: light sabers and flashlights with whirling, colored lights and the like. We were just about at the top of the arched bridge when the fireworks display opened up like a cannonade and we stood there, transfixed. These were the most beautiful fireworks we had ever seen, and the fanciest. There were explosions of color with explosions of color within still more explosions of different colors. Demetrios said, “We’ll miss our bus,” but we didn’t care. Standing there in the press of the crowd, it was somewhat warmer, so we stayed 15 minutes, until the end of that particular competitor’s first round. Then we trudged the rest of the way across the bridge, ducking into Silcock’s Funland to warm up before continuing. The place is basically full of slot machines and other money-eating gadgets. I watched a man try that thing you’ve seen in which you try to pick up a stuffed toy with some hooks. It looks easy, but the catch is, the toy keeps falling out as you move it toward you. You put in another 50 pence and try again, with the same result. The Victorian carousel was all lit up and going, but we didn’t stop; we were too cold. On past the statue of Queen Victoria to Lord Street, under the glass arcades as far as Christ Church, then across the street and to our bus stop. At the bus stop, we met a loquacious man named Billy. He was probably around 60, but possibly younger than he looked. He was badly shaven and wearing a soiled knit cap. He wasn’t waiting for any bus, he mentioned. He said he had stopped drinking 4 years ago because it had been killing him. (I sat beside him and I made a point of seeing if I could smell any alcohol on his breath; I could not.) The thing was, since he had stopped going into the pubs (except for cigarettes), life had become very lonely. The only people he had known had been drinking buddies. His wife had been married twice already since she left him; his children had long ago given up on him. So he was sitting here to pass the time, dreading to go back to Formby, he said, and his empty house. We suspect he’s actually homeless, and he was sitting here for shelter from wind and rain. It’s hard do know how to help people like that. A few pounds won’t really accomplish much. Back in our own warm, happy home, we brushed our teeth and tumbled straight into bed, exhausted. After all this time of “showering” by standing in the tub and using a clean, empty, quart-sized milk bottle to pour water over ourselves, we finally, with Kath’s help, deciphered the shower system! And yes, the mysterious pull-cord that hangs from the ceiling near the door is involved. You have to pull it first. If you don’t, nothing else works. Pulling that cord turns on the shower gadget. Then you set the dial on the shower gadget, which determines the temperature of the little mist of water comes out the showerhead. It's a bit of fuss to find a temperature between boiling and icy, but somewhere between 4 and 5 on the dial will do it, with some fine-tuning involved. Today we went downtown, mainly just for fun and exploration. We poked around in various shops. We stopped by the estate agents to say hello to Kath. We browsed a large furniture store because Demetrios wants, one day, to put a sofa in our living room (“lounge”) in place of one of the loveseats. He did find one small enough, but we’re not ready for it yet. We walked to the train station to pick up a timetable, by which to figure out how to get to the airport in Manchester on Monday. We stopped by the town’s other taxicab company to try again to find the cabbie who rescued us in June, but were told we need to check with their main office in the town center because that’s where the computers are. Another day. And we picked up some laundry detergent and an airing rack, as it’s called here. And I made use of the laundry detergent and the drying rack as soon as we got home. The laundry situation had been becoming urgent. So that’s another issue resolved. We’ve been moved in exactly one week now, and we seem to have most issues in hand. We even have plans for getting a reliable phone and Internet service when we return and we know where and how to rent a TV. When you wake up in this neighborhood, you hear various birds chirping, twittering, warbling – and quacking. Yes, we have a resident duck somewhere nearby. Must go investigate. I haven’t identified any of the other birds yet, except gulls. Today we became members of the Ormskirk Public Library. Demetrios was hoping to find videotapes there of The Two Ronnies, a favorite pair of comedians, but there were none. We did sit down at a computer long enough to check e-mail and learn that our neighbor, Dickie, has pneumonia. It was market day again in Ormskirk, but we didn't see anything we were in any hurry to buy today. It was fun just to wander among the vendors and street musicians in this quaint little town. Today we received our very first piece of Royal Mail. (Doesn’t that sound grand?) It was a tax bill from the local council office. The terrorists have already won, in so many ways. The only other thing we managed to do was buy some crockery. We wanted something really pretty, but we could only find one store that had pretty things, and each place setting there cost about $100. There doesn’t seem to be anything between cheap and very expensive. So we skipped that and for now just bought four place settings of the cheapest stuff we could find. At least, this way, we have some sort of china for the tea we’re having tomorrow. And we’ll use it the next several days, too, as we’re running out of paper plates. Of course, we still don’t have a tablecloth or a butter dish. We haven’t yet found a tablecloth that fits our table, although we looked in three stores. We shall try, tomorrow morning, to remedy at least the butter dish problem. And another news flash: The keys with the orange labels unlock the BACK door into the communal hallway. Different lock from the front door. Still don’t know what the pull-cord in the bathroom does. Demetrios has discovered another item in the house we cannot identify. It’s a large, red button on the wall beside the bed in the smaller bedroom. There’s one identical to it beside the front door, too. We’re assuming these are emergency call devices, given that a very old lady (Mrs. Williams’ mother) lived here before us. However, we aren’t going to push that button to find out. We met some of our neighbors today in the common hallway. Young woman’s name is Carrie or Keri, and the woman with her, Pat, was “my partner Graham’s mother.” No time to chat; their arms were full of groceries and we were getting ready for tea. I’m hoping Graham is a man. We never did find a butter dish or a tablecloth, so we ate on the bare table and put the butter on a dessert plate. We had an extra dessert plate only because Ray didn’t come, Jacqui’s husband. Another glitch was that somehow we came home yesterday without the saucers we had intended to buy. In the store, they were the first items we set aside, but apparently we never even got them as far as the checkout counter, because they do not appear on our receipt. Make tea much stronger than Americans usually do when you plan to serve it English style, with milk and sugar. Otherwise, although it looks fine in the pot, when poured into a teacup containing milk, it will turn a nauseating color of greenish gray. Never put the crumpets in the oven to warm until after your guests arrive. This is because you want to time the warming so as to serve them piping hot, but not overcooked and crunchy. If you send your husband to the supermarket, make your shopping list very explicit. Do not simply write “bread” but instead, write what sort of bread. That way you don’t end up trying to make tea sandwiches from baguettes. Sharp kitchen knives are best washed individually, rather than put in the sink or dishpan with everything else. Sharp knives are best stored separately from other implements, too. Always test an unfamiliar oven a time or two before using it to bake for company. Need one of those triangular thingies on a handle. Cake/pie server. Also need one of those serving plates with two or preferably three tiers. But be sure you have a place big enough to put it before buying one! It’s easy to find a 4’ by 6’ oval tablecloth in the States. Buy a set of sharp knives for your kitchen in Richmond! You seem to have forgotten what one is. The main thing is, we enjoyed Jacqui’s company very much, and hope she had a good time, too. We got to know one another better, and Demetrios was especially delighted that she had known some of the people he used to work with, in particular, Mr. Burgess, a doctor who actually hired Demetrios for his first job. Demetrios has looked up to him as a great physician, mentor, and father figure all these many years. Jacqui’s husband, we learned without asking, supports Manchester United (soccer team). So does her son. They’re rebels, she added, nonconformists here, where most people apparently are for Liverpool. We had tea and crumpets, cucumber sandwiches, tomato ham sandwiches, egg salad with watercress sandwiches, crunchy scones with clotted cream and strawberry jam, an apple pie, and some of what the Azerbijani man at the outdoor market called baklava, but the Greeks call it finikia, that cylindrical shaped sweet that looks like it's coated with shredded wheat. In spite of the blunders, we passed a perfectly delightful afternoon with Jacqui, and once the washing up was done, an equally delightful evening, just the two of us, still unable to comprehend our great good fortune/blessing in having a little home here. And the even greater wonder of getting to share it with each other. There was no way, today, to get to an Orthodox Church. We’re thinking we’ll probably rent a car next time we come. At least one of the Orthodox Churches is accessible by bus, but I stupidly stored the address on my computer, which I cannot normally access. So we went to services at Sts. Peter and Paul (Church of England), otherwise known simply as “Ormskirk Parish Church.” It’s THE landmark in town, visible from almost everywhere and sitting near the center of town. It’s large, made of cut stone, and it has both a spire and a tower, both at the same end of the church, giving it quite an odd look. We came in during Ann’s talk, very sorry to have missed the Greed Activity. After Ann’s talk came the Mother’s Union Enrolment and prayer. Then there were more prayers, led by Arthur, and another traditional hymn. Then, the final blessing, then another praise song. Then the people just sort of straggled up and out the door to shake the hands of two people in vestments, a woman and a man. We didn’t get either of their names, although we chatted a few moments. Why does the church have both a tower and a steeple? Yes, to put it euphemistically. The tower was apparently built to house four Bells which came to the church from that nearby monastery, called Burscough Priory, after its dissolution in 1536. Ah, yes, you remember: the Reformer, King Henry VIII, dissolved all the monasteries. So here were four perfectly good bells coming to Ormskirk, and where to put them? “The steeple already standing…was … inadequate for them.” So, build a tower. One of those Priory bells is now standing beside the pulpit, it having been retired from service (“pensioned off”).” It was cast in 1497 and recast in 1576, and bears a Latin inscription and the Tudor rose. The tower now has a full complement (“peal”) of 8 bells. They ring every 15 minutes, Westminster chimes. The clock, formerly mechanical, has been electrified. You can still see here carved stone effigies of four of the Derbys. The Earl of Derby is this church’s patron to this day. Wait, there’s still more interesting history. I mean there’s tons of it, but I’m only telling you the most interesting points, in my opinion. King Henry VII once worshipped in this church. King Henrie did take his progesse into Lancashire the 25th daie of June, there to make merrie With his mother the Countesse of Derbie Which then laie at Lathom in the countrie. It is said that during his visit he worshipped in Ormskirk Church and the part of the church set aside for the King’s company is still known as the King’s Chancel. In 1922, the Derby Chapel became the War Memorial Chapel. Now you can see in it stained glass windows depicting the colors of each of the allied forces, among them, the USA and Greece. The church was refurbished in the late 1800’s, during which time the “rough pavings over bare earth” were replaced by a concrete floor. But the catch is that 7,000 burials had already been recorded beneath that old floor. So before the concrete was poured, these were excavated, and the bones reburied in a common grave in the churchyard. Seven thousand! Demetrios and I made our way, eventually, to the coffee hour in the church house (parish hall), where we met Jim, who generously spent a long time socializing with us. He learned more about us than we did about him, I’m afraid, but we hope to meet him again. He’s a tax official from Liverpool. We also met Peter and his wife, Pat, who know Demetrios’ old colleague, Dr. Underwood. They inform us that Dr. and Mrs. Underwood both are alive and well, and live on Greetby Hill Road. In fact, Pat said, “I’ll just pop in there on my way home and tell them ‘Dr. Theo’ was inquiring after them.” We thanked them very much for that kindness, and look forward to seeing the Underwoods sometime. Demetrios, though, says Dr. Underwood was always a little distant. For me, there is a great pathos in thinking how poor Demetrios came here, feeling rejected and alone, and passionately and permanently gave to this town and her people his whole heart and soul, made them his surrogate family – and they never realized it, nor had any way of understanding how desperately attached to them he was, and with a few exceptions, they rarely seem to have thought of him as much more than an amusing foreign oddity. The foreigner came and they were kind to him, but then he left, as foreigners do (and should) and, for them, that was that. Anyway, people at the coffee hour were very kind to us, as everyone here seems unfailingly to be, and we were glad we had come. Across the street from the church is a knitting shop, so we stopped to let me peer through the window. Yes, it has all kinds of yummy yarn, and I shall very much enjoy shopping there. Fortunately, it’s in the very easiest spot in town to find. There's a knitting group here, too, called Knit 'n' Natter. It meets in the Church House on Monday afternoons. I'll try to join it, if it's still going when we return. Just as we were getting ready to cross the street, a friendly voice hailed us, and it was the man with whom we had shaken hands after the service. He’s a tall, stout man, with very round, blue eyes in a very round face, under wavy white hair. “It’s Chris,” he said. Ah, yes, the Chris mentioned on the program, co-leader of the Time of Open Grumbling, as well as the Greed Activity. So we chatted a few moments. He has been to Richmond, Virginia, and says he loved it there. When Chris had said goodbye, we spotted the cab company, so we stopped in there, as well, to see if the lady there could help us find the cabbie who came to our rescue on our last trip. We want to invite him to tea some day. However, she couldn’t find a record of any fare to Southport from the railway station on that date, and suggested he might have worked for the other taxi company in town. We shall check that out later. Then we meandered over to the Hayfield Inn for Sunday dinner. Jim, at the church, had discouraged us from going to the Queen’s Head, which advertises Sunday roasts, so we took his advice. On our way home, passing the playing fields, we noticed a game of Rugby just getting underway. I’ve never seen Rugby, so we stopped for about 15 minutes to cheer the Ormskirk team. Then, as it was chilly out, we came home. We woke up to a very cold apartment, turned on a space heater to warm it up some, and slept until past 10:00. For breakfast, we had hot tea (brought from Richmond) and coffee and chunks of bread ripped off the loaf, spread with butter. We don’t even have a butter dish; the slab of butter sits on a paper place. We don’t have any jam or jelly or honey, either. We do have some spoons and forks and dinner knives, brought from Richmond. But breakfast was delicious because it was the first meal in our new home. I’m happy to report that both mattresses are very comfortable, nice and firm. Our major accomplishment today was to furnish our kitchen with various needed gadgets. We had to go all the way to Southport to do it, but we found there a home store called Dunelm, which is something like Bed, Bath and Beyond. So we bought things such as: a potato masher, garlic press, spatula, sharp knives (including a bread knife! ), skillet, covered saucepan, set of 4 tumblers, set of 4 wine glasses, vegetable peeler, a slotted serving spoon and a solid one, canisters for: tea, coffee, sugar, flour, and rice; and a kitchen dustbin. That, combined with the things Mrs. Williams gave us, plus the things I brought from Richmond, leaves only about 6 items (plus groceries) on our shopping list. “Pack the bags about evenly as to weight,” Demetrios told the young lady at the check-out, “because we have no car and we must carry these all the way to the bus stop on the other side of Lord Street.” That’s a distance of about three quarters of a mile. There was no plausible way, just then, to dispute that. We toted our heavy loads to the bus stop in a misty rain, the kind that umbrellas don’t help, because the drops float up or blow up under them anyway. Met a pair of jolly drunks at the stop, who talked merrily with us for a few minutes, we understanding little of what they said. People in this country do speak English, but with a foreign accent. We left our purchases in their bags and went out to get a bite at Five Ways, a large restaurant very near us. They have a so-called Diamond Club for people older than 50; if you join it, you get discounts on meals. So we did and we did. I had my first Yorkshire Pudding. Do you know what this famous thing is? Again, not pudding at all, as Americans think of it. It’s a large dollop of dough that appears to have been deep-fried. And it’s perfectly tasteless. So why has Yorkshire Pudding been a British favorite for centuries? My guess is, because it’s a perfect sponge for sopping up gravy and other sauces. When Demetrios asked our waiter where he was from, the young man smiled and said, “Liverpool. Been in Ormskirk 15 years now, though. Feel like a born-and-bred.” Then he added, “Support Everton.” He nodded and disappeared. Telling which team you support is evidently an important piece of an introduction around here. I teased the fellow later and told him the tip would’ve been a pound more had he not supported Everton. Back home, we had a great time unpacking our purchases and putting them away. Of course that added to our trash situation… in the morning, in the morning we shall figure out the acceptable method of disposing of things. Tonight we pulled out the notebook Mrs. Williams left us, containing instructions for almost every gadget in the house. Time to learn to use the heaters. Like the water heater, the radiators only store electricity during the night, when the rates are lower, and then radiate heat all day (and night) long. But you have to know how to set the knobs or dials or whatever. In the process of reading up, we found several pages of printout Mrs. Williams had left us about various brands of combination washer-dryer machines. She even listed the technical specs and prices and pictures. Yes, some day we will replace the washer with a washer-dryer. But not soon. Hint from Jane: Read the instructions!